Marine Studies at Prescott College has a strong focus on the ecology of the marine environment (physical oceanography and marine ecology) and on the relationships between humans and the marine environment. Students graduating with a competence in Marine Studies have a foundation in life sciences, physical sciences, human ecology, conservation, and resource management, as well as a broad scope of supporting courses in literature, politics, economics, and humanities. Direct field experience further establishes a student's understanding and respect for the power and vastness of the world's ocean. Most Marine Studies students follow one of two main paths: marine ecology/field research/natural history or marine conservation/resource management/policy. Many Marine Studies courses take place at Prescott College's Kino Bay Center for Cultural and Ecological Studies in Bahia Kino, Sonora, Mexico, on the coast of the Gulf of California. 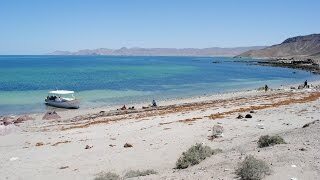 The Kino Bay Center sits amid the diverse Sonoran Desert on the coast of the Midriff Island region of the Gulf of California, an area rich in marine habitats, seabirds, marine mammals, fish, mangrove estuaries, and other coastal flora and fauna. Our relationships with the local Mexican fishing community and the native Comcaac village enables us to explore a variety of marine environments, study human interactions with the sea, and participate in cooperative marine conservation research projects. Marine Studies students are also encouraged to broaden their experience by participating in an Eco-League exchange with either College of the Atlantic or Alaska Pacific University. Marine Studies at Prescott College has a strong focus on ecology of the marine environment (physical and biological oceanography) and on the relationships between humans and the marine environment. Students graduating with a competence in Marine Studies should have a foundation in life sciences, physical sciences, human ecology, conservation and resource management, as well as a broad scope of supporting courses in literature, politics, economics, and humanities. Direct field experience rounds-out a student's understanding and respect for the power and vastness of the world's ocean. • 4 distribution courses and ecology course required for ES competence. • 5 Marine Studies core courses. • 2 Science Foundation courses. • 2 Conservation Foundation courses.